A vast expanse of 3 acres provides a perfect ambience for an aesthetically chartered school building. The lung space, the open lawns are marked with a colourful bonanza of fresh floral bounty. 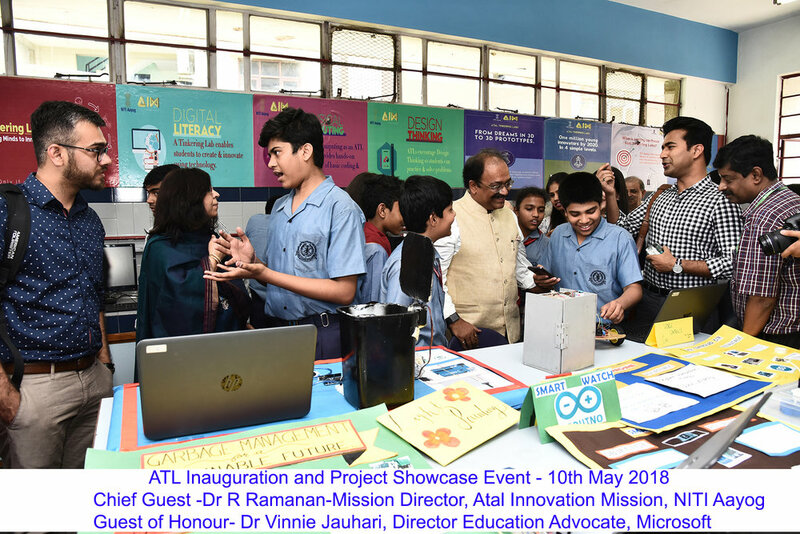 An awe inspiring WiFi enabled infrastructure comprising of 90 well ventilated classrooms, science, maths and language laboratories and libraries where books span time, space, culture and genre. To aid the process of learning we have a sound proof auditorium, state of art recording studio, an AV room, two resource centres for teachers, a sports field, a basement to facilitate physical fitness and indoor games, a discovery room to enhance the scientific temperament and an art gallery to showcase the creative flair of the students. The serene ambience inspires a love for reading. Information at the click of a finger tip invites the young users to delve into the magical world of words and the wealth of research material available. The school has three well equipped libraries, the Junior School Library ,the Middle School Library and the Senior School Library. Interaction with eminent authors, book reviews and reading sessions are conducted regularly exposing students to good written and reading skills. The reference library, which is fully computerized and houses over 20,000 books, is a treasure trove of information that has been built assiduously over a span of more than 5 decades and continues to grow each year. A scientific temperament is nurtured through fully equipped and suitably designed laboratories for Physics, Chemistry and Biology Students are encouraged to use the facilities for enhancing their innovative and scientific skills. State of Art ICT Laboratories for the primary, middle and senior levels help foster technological skills. Students design websites and create software programs in keeping with international requirements. The Multimedia Centre has sparked the imagination and creativity of the students producing outstanding art work, photography and documentaries at the centre. The School's Language Laboratories are equipped with the latest audio visual technology for the students to learn, French, Japanese, Russian, Spanish, Chinese and German that are offered to students from Grade VI upwards. The well equipped Home Science lab is a bright airy room that provides the perfect ambience to learn the art and science of Home Management. The Discovery Room for Primary Classes I - V provides an opportunity to ascertain the principles of science through hands on activities and the use of audio visual material. A questioning scientific temperament is nurtured in each student. The formulae of mathelogical intelligence is cracked in the number zone of Maths Lab. Interactive white boards are used for classroom teaching and involve students to learn with technology. Notes, flowcharts, drawings and PPTs used in the course of teaching are saved to be accessed as and when required. Students are actively involved in their learning through presentations made by them using the whiteboards. The use of audio visual aids is well integrated with the school curriculum and used by the staff and students alike. The Audio-Visual Room with its OHP’s, slide projector and screens is equipped both for teaching and presentations by students. A large collection of educational CDs and DVDs are used regularly as teaching aids for enhancement of the students’ learning. Teachers the change-makers of tomorrow are empowered through regular and constant research in the inviting ambience of the Learning Hub. Our latest addition to foster technology enabled education. An IT enabled Resource Centre provides support to keep pace with the dynamic nature of learning and pedagogy in education. The In house programs are organized regularly and Learning Communities provide classroom teachers with real opportunities for continuous Professional Development, Research and Growth. Continuous professional learning and Learning Communities within the school provide teachers with regular in service training to share contemporary pedagogical practices and acquire skills for facilitating learning to the 21st century digital native learner. The recording Studio is a state of the art facility that offers students real time experience of being in a studio. All the school functions have their voice over recordings in the studio under purview of the teachers and the students. A synaesthetic temperament is nurtured and showcased in the Art Gallery. A blend of colour and design elevates the human mind to merge it with the supreme being.Regular art exhibitions are held to nurture & provide individual and collective talent. The Basement of the school is perpetually abuzz with a plethora of activities ranging from drama workshops, to dance classes, yoga sessions and indoor games. Sports facilities at school include basketball courts, tennis courts, badminton courts, football field, cricket pitch, skating ring, volleyball courts and an indoor gym.